I thought I had a better shot of this dress where I was posing quite nicely but I am pretty sure I accidentally deleted it. So, instead I choose a shot that also featured my little girl Pandora. It was just a bonus that she matched my outfit perfectly. Now, you might be wondering what I’m doing…you see I was trying to convince my girl that the camera remote was a treat and that she should jump up to get it. She’s pretty smart and wasn’t buying it. I picked this lace dress up when we were in New York City last year at Macy’s. I had one hour to shop like a mad woman there since we were on a pretty tight schedule. I was a bit hesitant because it was cream and as a lady who almost always wore black it was quite the leap for me. It cames with a matching cream slip but I prefer pairing it with a black crinoline so you can see the pattern in the lace. I don’t wear this dress too often but it is one of my favourites. 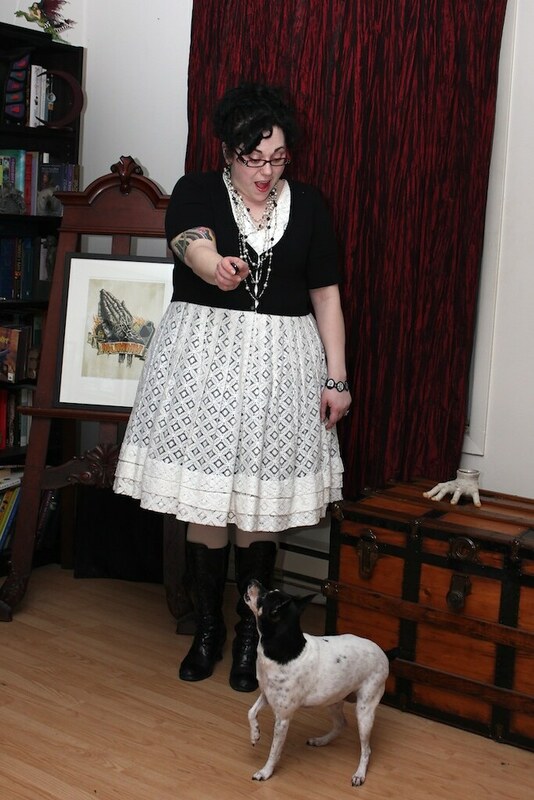 Agreed on the black crinoline under the dress. White underneath would make it look too “Little Bo Peep”-ish, imho. The black underneath gives it style and makes a statement. 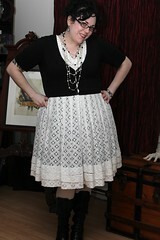 @thirtiesgirl I can see what you mean about it looking “Little bo peep” with the white slip underneath. I keep trying to think of another outfit that I could wear with the slip but so far everything I’ve come up with is a bit too “Courtney Love” ala 90s for my taste.